If your company needs info-technology services and you're not a Fortune 500 company, who do you call? This Detroit IT startup by Terence Willis and Dwayne Carson might be just the ticket. 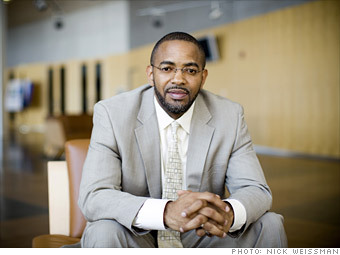 After serving in the U.S. Army and taking college courses in his spare time, Detroit native Willis returned home and started the business with his friend Carson based on providing IT services to companies and non-profits that can't afford their own IT departments. They took advantage of a local incubator: TechTown, the research and technology park associated with Wayne State University. 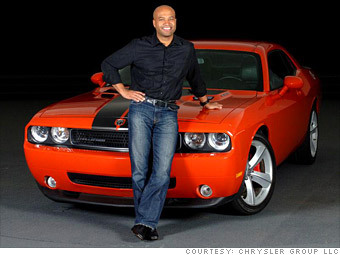 Ralph Gilles - SVP of design, Chrysler Corp.
SVP of design, Chrysler Corp.
Gilles became a household name among car buffs after leading the design team that came up with the retro-elegant look for Chrysler 300 luxury-sport sedan, an instant hit in 2004. Now head of the Dodge brand, he has six new vehicle designs scheduled to emerge in the coming year. For Chrysler, which emerged from bankruptcy last year under the control of Fiat, the new look comes not a moment too soon. Gilles, born in New York City to Haitian immigrant parents, went to design school in Detroit. He believes the region is set to blossom because of a "different corporate culture, a whole bunch of old companies with new innards," as a result of restructuring. Never ceasing creativity is the heart of Dumas' genius. His action filled dramas and novels capture the true essence of human spirit. Dumas' sense of adventure lives on through the pages of his works. The United States Senate is expected to take up legislation to provide settlement dollars to Black Farmers and Native Americans, because of decades of discrimination and mismanagement in the U.S. Department of Agriculture and the U.S. Department of the Interior. Please call both of your Senators today and tell them to support funding for the Pigford and Cobell settlement. We aren't sure exactly when this will go to the Senate floor, so it is critical you make your calls to your Senators as soon as possible. The Pigford II settlement, which was announced by the US Department of Agriculture and the USDepartment of Justice in February of this year, would provide as many as 70,000 African American farmers, many of whom suffered blatant discrimination at the hands of the U.S. Department of Agriculture for decades, with cash damage awards and debt relief. These claims cannot even begin to be investigated, let alone settled, until after Congress has appropriated the funding. 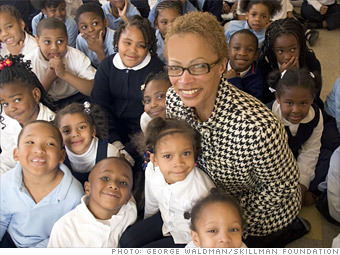 Funding for the Pigford settlement had been approved by the US House on July 1, 2010, but the money was stripped by the U.S. Senate on June 22, 2010. The legislation to be considered also contains $1.41 billion to provide for the Cobell settlement, which involves lost royalty funds flowing from the mismanagement of natural resources on Indian land by the U.S. Department of the Interior for more than a century. In the Cobell case, the federal government mismanaged billions of dollars in oil, gas, grazing, timber and other royalties overseen by the Department of Interior for Indian trustees since 1887. Essentially, Black Farmers and Native Americans won their lawsuits, but Congress has to appropriate the funds for the settlements to actually be paid. There is incredible urgency to pass this appropriation to settle the class action lawsuits of African American farmers and Native Americans. Many of the farmers who would qualify for monies under the settlement have waited as long as 10 years to be compensated; some have already died or lost their farms. After years of discriminatory treatment by USDA credit and program agencies, these farm families have already waited almost a decade for compensation for these well-established claims. It is time to allow these farmers to focus on the future, and move forward unencumbered by the racial discrimination of the past. The longer the Senate delays, the more difficult it will be for this funding to be appropriated. This bill has the support of President Obama, Secretary of Agriculture Tom Vilsack, Senators and House members of both parties and the Congressional Black Caucus. Your Senators need to hear from you. Call your Senators today! When Bronx student Justus Williams started third grade at P.S. 70, his mother, Latisha, urged him to take on chess. The hobby was “less common” than basketball, she said. But Justus wasn’t enthusiastic at first. “I thought I was going to be embarrassed,” he said. As it turned out, mom knew best. Justus, now 12 and completing sixth grade, is the highest-rated chess player in the U.S. in his age and gender group, and fourth overall in World Chess Federation international rankings for his age group. Justus found out recently that he will travel to Halkidiki, Greece in October to represent the U.S. in the 2010 World Youth Chess Championship. That’s after a summer filled with tournaments such as the Pan American Youth Chess Festival in Brazil and the World Open in Philadelphia. As he started winning, the champ began to see chess as less of a chore. “My mom didn’t have to push me to go to tournaments anymore,” he said. His grades got better, too. Smith, who coordinates Justus’s tournament play, started bringing him to more prestigious games when he hit fifth grade. He now practices one or two hours a day. How does a 12-year-old chess champ prepare to become a master? His mom figures that out. She makes sure Justus gets a good night’s sleep and steers him from junk food; healthier foods such as fruit and chicken salad help his mental stamina, she said. Justus now attends middle school at I.S. 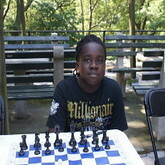 318 in Brooklyn–a 90-minute commute from home, but the school’s strong chess program makes it worthwhile, he said. Still, Justus said he gets nervous before tournaments. “After the first round when I win, I start to get comfortable,” he said.